Following the success of their BAFTA winning series The Killing and Borgen, and the newly BAFTA nominated series’ The Bridge, Arrow Film’s Nordic Noir label have announced the release of Van Veeteren Season 2. One of the most suspenseful psychological thrillers ever to come out of Sweden, the Van Veeteren series brings to life the best-selling crime novels by one of Sweden’s most popular mystery writers, Håkan Nesser, whose books have been translated into more than ten languages. Set in the fictitious city of Maardam, in a made-up country that could be anywhere in northern Europe, the series follows the murder cases of retired chief inspector, Van Veeteren, and his two crime squad protégés, Münster and Moreno. The series starts with Van Veeteren going into retirement. He has bought an antiquarian bookshop where he plans to live out his remaining years devoting himself to his other great passion, books, and trying to spend more time with his family – especially his estranged son Erich, whose history of crime and drug abuse are at least in part a result of Van Veeteren’s deep commitment to his work. His retirement, however, is in name only, as Münster and Moreno continue to consult the master detective, who helps them with new perspectives in their investigations and invariable ends up getting actively involved himself. And one senses he would not have it any other way. 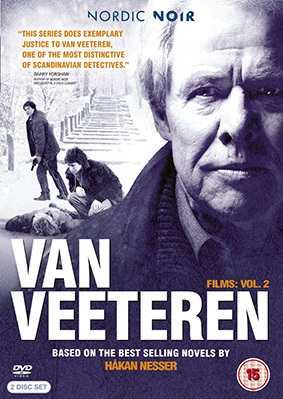 Van Veeteren Season 2 will be released in the UK as a 3-disc DVD set on 25th November 2013 by Arrow Films under their Nordic Noir label at the RRP of £19.99. We've not been supplied with a trailer specific to this release, but this one for the American DVD release of the first series does at least give a flavour of it.